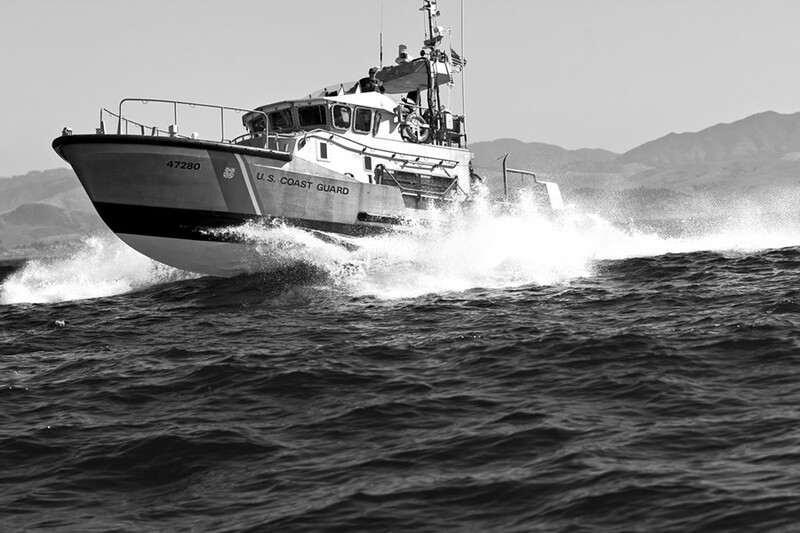 CUTTING TO THE CHASE: A U.S. Coast Guard response boat—known as a cutter—hightails it out of the mouth of Morro Bay Harbor, which has housed an agency station since the early 1990s. The Coast Guard is currently in talks with the city over leasing a site that would allow them to expand their facility. Despite early disagreements over possible locations for a station expansion, the Morro Bay City Council wants to continue its good relations with the U.S. Coast Guard and explore available options that would allow the agency to revamp its facilities in the harbor without affecting the look of the tourist-heavy Embarcadero. On Oct. 8, the council voiced its opposition to a proposal that would allow the Coast Guard to enter into a long-term lease of a 1.3-acre city-owned property near Coleman Park on the northwest corner of the Embarcadero. Citing a lack of space and other needs, the agency is seeking an approximately 2,500-square-foot boat maintenance bay for its 29-foot response boats, repair shops, and storage and administrative space. A second, 1,200-square-foot building will house Coast Guard station functions and administrative space. When additional funds become available, the Coast Guard plans to expand the building by adding a second story, according to a report. City Manager Andrea Lueker said the agency approached the city in February about the possible expansion, and because of budget uncertainty, it’s on a tight timeframe. One of the other site options is the Dynegy plant lot across from the current station, which may become available if the plant shutters this or next year. The council declined to vote on the item, but instead continued it to a yet-to-be-determined date while the staff continues to discuss the matter with the Coast Guard, which, as of press time, remained short-handed due to the federal government shutdown.